Note from shop owner Here's the scoop . . . . . this shop will be open every other week. I can receive convos at any time so do not hesitate to contact me with requests or questions please. Once I'm at my shop, I can ship via priority mail for 2 to 3 day deliveries. Here's the scoop . . . . . this shop will be open every other week. I can receive convos at any time so do not hesitate to contact me with requests or questions please. Once I'm at my shop, I can ship via priority mail for 2 to 3 day deliveries. Back to order as promised! Thank you for being able to create my custom order request even though your shop was or is closed for vacation. I hoped that Claudia could make a genuine custom Turquoise necklace for a special event I'm attending and she did it masterfully. I am delighted with the lovely Turquoise beads she used to create my new necklace design with Lapis Lazuli and Pewter. It is so striking and beautifully made. I appreciate it so much. Thank you! I ordered these earrings plus an Agate and Amethyst necklace for my sister-in-law from this seller. My sister had her eye on these earrings so I knew she'd love them. They did not disappoint. The crystals are lovely and the earring design is beautiful. They are stunning on! The Amethyst and Agate necklace is gorgeous as well, even prettier than its photos. The stones are top quality and the colors and different textures of the two stones together are lovely in this necklace. Its workmanship and design are top-notch. We highly recommend Claudia's jewelry, her designs, the care and workmanship that goes into her beautiful pieces. We will be back again. 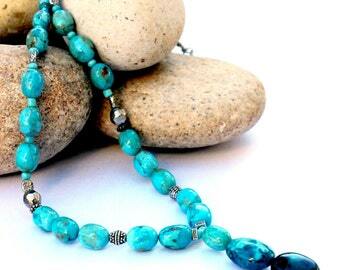 Genuine Turquoise is the birthstone for December. Visit my shop to see natural Turquoise or Mohave Purple Turquoise necklaces with stones from the Kingman Mine, AZ. CoastAndMountainArts.com. Brown kraft paper gift box provided for most jewelry items, depending on the item's size. I search gemstone shows and local shops throughout the West and Southwest for unique stones for my designs. I will be re-opening my shop this Fall. Thank you for following me and being loyal customers.....although I live by the sea, I have always loved the mountains and the Western landscapes of our beautiful country. My jewelry designs reflect my connection to history and to both land and sea. I returned this past summer from a gemstone shopping excursion to the Southwest with so many beautiful stones to incorporate into my designs. Many of them are rich, deep-colored stones such as navy Lapis, genuine Turquoise, Mojave Purple Turquoise, Red Creek Jasper, deep green Chrysocolla, plus Brass, Copper, Sterling Silver, Silverplate, and Pewter. I'm looking forward to mixing these elements in my new jewelry pieces that will compliment current fashion trends. This is a unique shop of my handmade artisan jewelry designed with beautiful, high-quality stones for jewelry ranging from casual to more formal pieces. 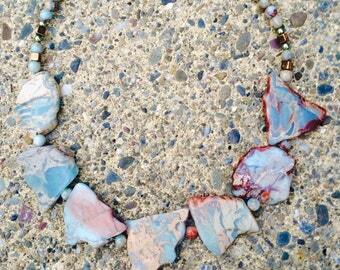 Each piece that I design is created to enhance the natural beauty of the stones that I have selected. 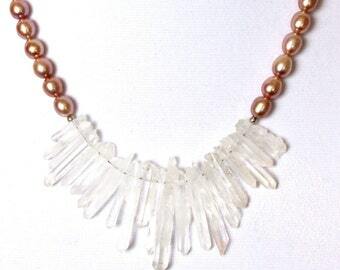 I try not to duplicate my jewelry pieces except upon request and I use only high quality semi-precious gems and pearls. All my work is guaranteed. Thanks so much for visiting ! I am a self-taught jewelry artisan for over 10 years. For retailers: I am an approved "Etsy Wholesale" shop member for retail stores & boutiques. I do not have a production partner but occasionally purchase pendants to incorporate into my jewelry designs. Welcome to my shop. My work is influenced by the colors of nature found in awe inspiring places like forest woodlands and coastal tide pools from the Sierras down to the sea. My necklace designs incorporate different types of jade, carnelian, opals, garnets, aquamarine, labradorite, seed pearls, freshwater pearls, agate, jasper, chalcedony, and more. The styles of my designs range from necklaces of large chunky stones to more delicate, medium-sized beads and more complex design patterns. Usually my choice of color combinations within one necklace are blends of similar tones, but sometimes I use contrasting colors for a more striking effect. Custom orders are gladly accepted. I am excited to have the opportunity to offer my jewelry designs and photography/photo cards on Etsy. I have been painting and drawing as an avocation for many years. It had not been until Spring 2012 that I was able to devote more time to my jewelry making, artwork, crafts, and photography which are a joy for me. Thank you for visiting my shop. Any damage to an item through shipping will be handled by the USPS. "I use First Class or Priority Mail with Tracking ID and USPS insurance which is the safest way to send my items. If there is any damage, please take the item & all its packaging into USPS for them to process a refund on damaged items ... thank you". If you have any concerns about a jewelry piece when you receive it, first contact me ASAP to let me know about the problem. If any items are damaged due to shipping, please let me know ASAP. Each necklace is displayed to depict the design and integrity of the piece as realistically as possible, and to reflect each piece's unique qualities for you, the customer. My goal is to provide my customers with quality pieces that they will appreciate and enjoy wearing. Customer satisfaction is my top priority. Contact me via convo or email: cloud95023 [!at] yahoo.com if you have any questions/concerns. You will be able to use PayPal, Etsy gift cards, or a credit card for ordering your item. Once payment is received into my account, I will ship your item, usually 1 to 3 days for jewelry and 3 to 5 days for photo cards. California residents: Sales tax rate is 8.25% of item's price for most California residents. * I'm sorry but I do not sell internationally. * No cancellations accepted once your order has been shipped. * I package and ship jewelry items within 1 to 3 days of receiving your order. That is my handling/packaging time frame. The post office's shipping time frame varies from 3 to 4 days for 1st Class Mail so please keep that in mind when ordering. * For clarity, please convo me if you have any questions about shipping time frames. Thank you. ** I mail your NECKLACES via USPS Priority Mail and smaller jewelry items & photo cards via First Class USPS mail all with Tracking ID to ensure your order arrives at your home or place of business. *** IMPORTANT NOTICE: Please let me know via convo or email if you have any questions regarding shipping of an item. Most items will be wrapped in bubble wrap and shipped within a cardboard box provided by USPS mail service which includes Tracking ID. It is IMPERATIVE for any refunds by the US Post Office in case of damage by USPS mail service, that you take photos of the jewelry item/s showing the condition in which it arrived. The U.S. Post Office requires photos to process its claims. This is your proof of the damage received during shipping. You must also save the original packaging along with the broken item to show to the post office staff when you go to process your claim. I use Priority Mail to send my necklaces and sometimes First Class on smaller jewelry items so reimbursement for damages during shipping will be paid for by the US postal service. You must apply directly to them. In the event that you need to send a jewelry piece back to me for repair due to shipping damage, be sure to pay for Tracking ID. I will reimburse all return shipping costs upon receiving the jewelry back. It is a small price to pay ($1.00) to ensure the package was mailed back with tracking ID, but the customer must be willing to take this step for their own protection. * Etsy policy stands behind sellers and customers that use Tracking ID. Be sure to save all your receipts as proof of mailing or shipping. This is for the customer's own protection. I guarantee my workmanship. I find so much enjoyment in creating quality jewelry from beautiful gemstones and sharing them with others through my shops. Thank you so much for your purchase. PLEASE NOTE: All necklaces are created by hand, so no two items are identical. Please allow for slight variances. I am an approved Etsy Wholesale Program Seller for retail shops, galleries, museums, and boutiques. If you are a wholesale buyer, please ask for my product linesheet.